Recommended citation: Ferreri R, Bernardini S, Cracolici F, Bechini F. Integrated Oncology in an Integrated Medicine Hospital in Pitigliano (Grosseto, Italy). OBM Integrative and Complementary Medicine 2019;4(1):18; doi:10.21926/obm.icm.1901008. Background: Complementary medicines (CM), including homeopathy, acupuncture, and traditional Chinese medicine, have been introduced for cancer patients undergoing chemotherapy and radiotherapy treatment in the Pitigliano Hospital Centre of Integrated Medicine in order to minimize the side effects of these treatments, which improves quality of life and adherence to conventional therapies. Methods: Cancer patients (240) were enrolled in an integrated care model offering a comprehensive protocol including homeopathy and acupuncture, provided in line with the stage of the disease as well as in consideration of any comorbidities in individual patients. The following data were collected upon enrollment and also after 1-2 months of the integrated therapies:SF-12 quality of life (QoL) questionnaire;Edmonton symptom assessment scale (ESAS);and a questionnaire on the use of conventional medications. Results: There was a 92.4% reduction in symptoms (as monitored by ESAS) caused by the patient’s disease or by comorbidities. The SF-12 revealed reduced fatigue and increased wellness, as well as good adherence to the cancer treatments. Additionally, a reduction in the use of conventional medications for side effects, good control of cancer symptoms, and an improved QoL was also observed. Conclusions: This study suggests the use of complementary medicines to reduce therapy-related symptoms in oncologic patients without any adverse effects and to reduce the use of conventional drugs in this case. The increase in use of complementary medicines by cancer patients by cancer patients is often accompanied by a failure to tell their doctor (specialist and/or GP) of their use of these therapies, which are perceived as “natural”. However, their use may still expose patients to considerable risks to their health and can also interfere with or nullify their cancer treatments. For these reasons, while this phenomenon should be recognized and the demand for these treatments accommodated, it should also be adequately guided and governed in public health facilities to the most possible extent. In the reform and reorganization of Tuscany’s public health service, complementary medicines retained and consolidated their role as an appropriate, sustainable, and efficacious health resource . This can be seen in the Hospital Centre of Integrated Medicine of Pitigliano, where the most ambitious project for integrated medicine (IM) in a hospital setting is in progress . This project aims to enable cancer patients to access IM services throughout their diagnostic and therapeutic course, and is available for both patients undergoing cancer therapy in Pitigliano and those under palliative care at the Palliative Care Unit and Pain Management Outpatient Clinic at the Misericordia Hospital in Grosseto. A full project for integrated therapies in cancer patients is being carried out in the outpatient clinic of the Pitigliano IM Centre with the methodological criteria described in a previous article . For this project, the use of a dedicated space with rapid access enables these patients to access integrated therapies as soon as possible (ideally before beginning conventional cancer therapy). On average, cancer patients accounted for 5% of all patients attending the Centre between February 2011 and 2013; since 2014, the number of integrated oncology consultations has risen constantly (Figure 1). Figure 1 Percentage of cancer patients from the total of all outpatients. The present study included 240 cancer patients categorized according to the location of their disease (Table 1). Included in the table are 20 patients with metastasis (our holistic approach obviously makes a distinction between the primitive cancer (CA) and the metastasis, regardless of the localization. According to this integrated appraoch, this is a matter of the "durability" of the immune system, which has to be considered. For specificity, 4 of the mestasteses occured in patients with intestine CA, 4 had prostate CA, 7 had breast CA, 2 had ovary CA, 2 had gastric CA, and 1 had pulmonary CA. Table 1 Type of cancer. The impact of comorbities (i.e., any chronic disease or condition already present at the time of cancer diagnosis and whose morbidity may affect not only the symptoms but also the short- and long-term prognosis of the cancer itself) was particularly investigated in this study. Comorbidity classes were as follows: no comorbidities (0), one or more asymptomatic comorbidities (1), one or more symptomatic comorbidities under adequate treatment (2), one comorbidity not controlled by treatment (3), two or more comorbidities not controlled by treatment or one or more comorbidities at their most severe level (4). Within the 240 patients, 50% of them were under treatment for conditions already present when their cancer was diagnosed. The types and classes of comorbidities are presented in Table 2. Table 2 Comorbidities and comorbidity class* (52.5% of oncologic patients). *Six of them (2.5%) were not classified as chronic psycho-emotive patients because they were affected by depression and in treatment with antidepressants (serotonin reuptake inhibitors) for a few months before their cancer diagnosis. ii- Conditions for which no effective conventional treatment is available or for which conventional treatment was ineffective or could not be administered. iii- Extemporary conditions that would require the simultaneous administration of conventional medications whose use is incompatible with the ongoing therapy. These objectives seem to coincide completely with the needs expressed by patients in a questionnaire given to each patient at their first visit in which 80.9% reported a desire to improve their QoL; 52.5% asked for support during their cancer therapy (from the side effects of chemotherapy/radiotherapy) and 42% wanted to use IM to manage their comorbidities in order to avoid an excessive pharmacological burden. Homeopathy has long been used as a complementary treatment for cancer patients worldwide. However, as also seen with other complementary medicines, many patients use it without telling their oncologist, and is therefore outside of any controlled study. This leads to a dissipation of awareness of the full potential of homeopathic treatments. Despite this, in studies conducted by specialist groups, such as those at the Tuscan Regional Homeopathic Reference Centre in Lucca and at Merano Hospital , it has been shown to have therapeutic efficacy in controlling the side effects of cancer treatments, including nausea and vomiting as well as mucositis and skin lesions during chemotherapy and radiotherapy. Induced menopause during chemotherapy/radiotherapy (Sepia 15-30C; Lachesis 30C; Sanguinaria canadensis 9C; Glonoinum 9C; Belladonna 9, 15, or 30C). In all patients, the homeopathic protocol is carried out simultaneously with the acupuncture protocol. These two phases are not separate. Numerous studies have been conducted on the use of acupuncture in the treatment of cancer and its side effects [4,5,6,7]. They suggest that acupuncture can reduce vomiting caused by chemotherapy, reinforce the immune system during chemotherapy, and relieve the pain of neuropathy. More recent studies have also investigated the efficacy of acupuncture in xerostomia and its role in stimulating the immune defenses. Acupuncture treatments for nausea/vomiting (PC-6, VC-12, KD-21, and MP-10), for mucositis (GI-21 and VC-24), and for asthenia (VC-12, ST-25, VC-6, MP-10, and MP-6) have also proved useful in reducing the stress associated with cancer treatments. Both homeopathy and acupuncture have been included in standard protocols that are then adapted to the individual patients through the selection of personalized homeopathic remedies based on their specific traits (depending on the target of the remedy and the patient’s constitution) and on acupuncture points to stimulate individual reactivity. The IM visit offered to cancer patients includes these features, which involves both a homeopathic doctor and an acupuncturist. These are called "integrated protocols", which include the medical assessment given to the patient. The homeopathic protocol is carried out autonomously by the patient as long as he thinks appropriate. The acupuncture sessions are done in synergy with the homeopathic protocol in order to improve/complete the integrated protocol with 4 or 8 acupuncture sessions on a weekly basis. (We first perform 4 sessions and, if there is positive feedback, we do not follow up with 4 more. The 8-session protocol is therefore performed only in the case that the first 4 sessions are not effective). Two types of integrated protocols (homeopathy and acupuncture) were developed for two specific situations: one for radiotherapy and one for the treatment of neuropathy during treatment with taxanes, as illustrated below. The protocols used were derived by experience of our acupuncturist with the great masters of acupuncture (Dr. Nguain Van Gui, Dr Jean Marc Kespi, and Dr. Qiu Mao Lian). Acupuncture methods used were Traditional, Korean, and Five Element. Standard points under this protocol are Li-11, IT-7, CV-17, Ki-26, and Ki-27, as well as Shen points and the Korean middle finger point for mammalian cancer. Additional points were used for treatment of patient-reported symptoms as follows: CV-6 for asthenia; CV-17 for depression; and PC-6, PC-7, Baxie, and Bafeng for peripheral neuropathy. Generally, five point bilateral needling in tonification was performed, and not very deep. Sometimes elecrostimulation at a low frequency for twenty minutes was employed. De qi was searched for every point. Sometimes moxibustion was applied at 43 BL, 23 BL, and 20 BL. The acupuncturist was always a medical doctor (usually three doctors) with experience in traditional and microsystem acupuncture. The tutor of the acupuncturist team is Dr. Franco Cracolici (who has 32 years of acupuncture practice, is an executive member of the World Federation of Acupuncture and Moxibustion Societies, and an author of four books in Traditional Chinese Medicine). Patients underwent a 15-30 minute acupuncture session once fortnightly. Each patient received 4 to 8 sessions. Informed consent was given to the patient before every acupuncture session. A homeopathic magistral preparation containing equal parts Causticum 9 CH, Belladonna 9 CH, and Radium bromatum 9 CH was administered. This was given at a dosage of 20 drops three times a day for the entire duration of the radiotherapy or until the remission of clinical symptoms was observed. Acupuncture rationale is identical to the protocol for radiotherapy three types of acupuncture points were used and are standard points under the protocol. Classical distal traditional points (LU-7, PC-7, LR-3, TE-5, KI-3, and GB-34), central and trunk traditional points (GV-20, CV-12, and SP-21, as well as navel and abdomen acupuncture therapy), and microsystem points in synergy with Yamamoto somatoform acupuncture (brain points, Sujok therapy, thumb points, and ear points). Patients underwent a 15-30 minute acupuncture session once weekly. Each patient received 4 to 8 sessions. Informed consent was given to the patient before every acupuncture session. In regard to homeopathy, a magistral preparation of equal parts of Plumbum metallicum 30CH, Nerfs 5CH, and Causticum 9CH drops was administered. Twenty drops once daily were to be taken before eating, to be kept in the mouth for one minute before swallowing, six days a week for three to six months. The assessment of health is also made with an integrated approach. At first, protocols are carried out as described (acupuncture sessions, number of drops and administration of the homeopathic remedy, etc. ), then assessments are made with control visits after 1 or 2 months. There is no single assessment after one therapeutic session only: it is necessary to look at the synergy of the integrated protocol. The efficacy of the IM protocol was evaluated through different methods: the SF-12 questionnaire, to assess quality of life; the Edmonton Symptom Assessment Scale (ESAS), to assess symtpoms; and a questionnaire on the use of conventional medications. Symptoms were evaluated using the ESAS, which scored the main symptoms documented upon enrollment and 1 month after the start of the integrated treatment on a 10-point scale. The result was recorded as the difference between the final score and the initial score. Patients were then divided into 5 groups, from those with no or a 1-point improvement to those with a 9- or 10-point improvement. All questionnaires were first administered upon enrollment. The symptom or disease being treated with IM was then re-assessed using the ESAS after one month, while the SF-12 was re-administered after two months; the results from the questionnaire on the use of conventional medications were summed up at the end of the cycle. Our assessment with oncological patients occurs when the patient has already started his cancer therapy. Sometimes, he comes to us when he feels affected by negative symptoms and he does not want to treat them with conventional medicine. He is thus looking for an alternative to the symptomatic therapies he has been offered so far (antiemetic, painkiller, antispastic, etc.). Some other times, patients have already tried conventional drugs without success. That said, when we give them the SF-12 and register symptoms according to ESAS, we are “taking a picture” of that very moment. Afterwards, we “cut the picture out” by choosing the most appropriate integrated medicine, always trying to stick to the protocols. When patients come back for acupuncture sessions, we can assess whether they are doing what was recommended and if they are doing chemo- or radiotherapies. The objective of the integrated protocol was to minimize the side effects reported by patients in relation to their cancer therapies, thereby increasing adherence to those therapies. Table 3 subdivides patients according to the degree of improvement of symptoms as documented one month after the start of the integrated therapy. Our effort was different from the most common ESAS symptom assessments and aimed to put together all the data regarding the improvement of symptoms in all the patients examined from the first to the last visit. The list of symptoms collected were those indicated as a priority by the patient himself; our role was to collect them in a graphic (see Graphic 1). We thereby reported the status at every visit and then summed up improvements per patient. Finally, we reported only the data concerning the improvement registered during the assessment period. Table 3 ESAS scores for symptoms. The data in Table 3 refers to the average of the improvement registered and the percentage of patients that showed that range of improvement. 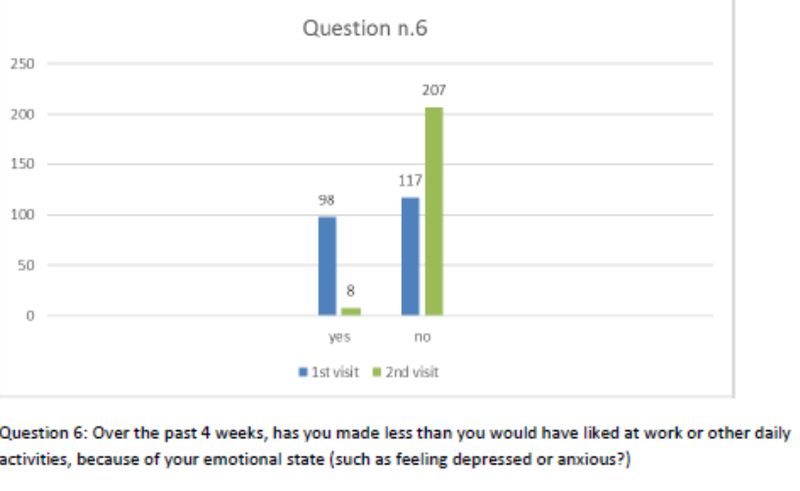 Patients also completed the SF-12 questionnaire at the first visit and at the follow-up after 2 months of the integrated therapy. Figures 2-13 present the responses. After one month of integrated therapy, 92.4% of patients reported some improvement in their symptoms on the ESAS, with 36.8% reporting a good or remarkable improvement or complete resolution. 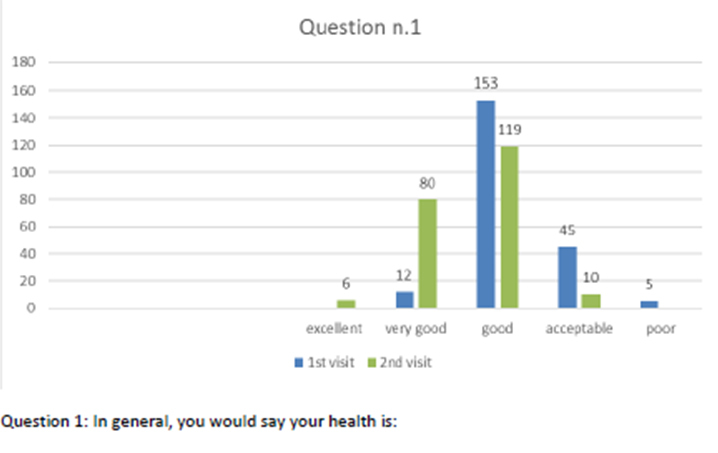 Examination of the items on the SF-12 questionnaire (Figures 2-13) revealed a remarkable improvement in perceived health two months after the start of the integrated therapy; the percentage of patients declaring their health to be “very good” rose from 5.56% at the baseline to 37.04% after two months of integrated therapy, with an additional 3% affirming that their health was “excellent”. 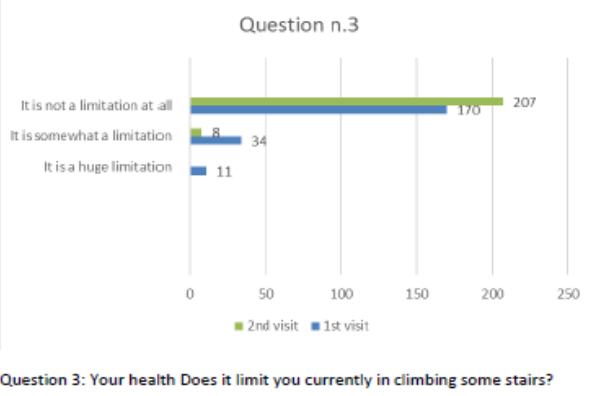 When asked if they had had to limit their physical activities due to their health, 54.17% of patients responded “no” at the first visit; this rose to 95.37% after two months. Investigation of their perceived energy level confirmed the trend of the previous items, with the percentage of patients affirming that they had a lot of energy most or all of the time rising from 8.33% to 52.78%, while reports of reduced physical performance dropped from 45.27% to 3.70%. Furthermore, at the first visit, 38.3% of patients answered “no” to the question, “Have you accomplished less at work as a result of an emotional problem”; this rose to 94.4% after two months. In relation to the interference of pain with physical activity, 44% of patients reported such interference at the baseline, but this dropped to 16.6% at two months. The responses to the other items confirm this trend of the reduced impact of symptoms in more than half of the patients. Both the mental and physical health of cancer patients improved, as can be seen from the bar charts in Figures 2-13, and it is this sense of physical and mental well-being that makes patients more amenable to the continuation of their conventional therapies. Moreover, we asked the patient if he used conventional drugs prescribed by the oncologist. The administration of conventional drugs for side effects is something the patient needs to do autonomously. The oncologist only tells him to use a certain drug if he shows a specific symptom; our patients also minimized their recourse to conventional treatments for the side effects of their cancer therapy (nausea, vomiting, intestinal problems, pain, etc.). The standard drugs for negative reactions to anti-cancer treatments are antiemetics; painkillers or anti-inflammatories, such as morphine; non-steroid painkillers; and cortisones. There are also second-line drugs that stimulate marrow production (for anemia or leukopenia), but in the cases in question, we never saw any patient use them. In this caseload, the use of conventional medications had dropped by 70-95% after one month of observation. This percentage of reduction refers to patients who used drugs to address collateral effects and then, thanks to integrative therapy, stopped doing so. Moreover, the earlier the introduction of the integrated therapy, the more evident the discontinuation or non-use of conventional medications was observed. The patients were followed for a mean of 2.5 years (with a range of 1 to 4 years) and 186 of the 240 patients (77.5%) completed follow-up, namely those with breast, intestinal, lung, ovarian, or prostate cancer. Almost a quarter (22.5%) of patients did not complete follow-up. Death occurred in 22 cases (9.17%), while the other 32 patients (13.33%) dropped out due to their inability to reach Pitigliano, which is a small town that does not have a railway station and is therefore diffficult to reach for anyone without their own means of . All patients who completed the four-year follow-up had maintained their achieved level of well-being and completed their cancer therapy protocol without interruption; 63.44% had also stopped all integrated therapy. The remaining 36.56% preferred a regular consultation, as they intended to continue with their IM visits independently of the cancer for which they had originally come to our care. The first significant challenge in evaluating the efficacy of an integrated medicine program was to identify the type of program offered, given that there are numerous protocols and the evaluation could depend on prior choices. We established our integrated approach in a “team/system care provider” setting at Pitigliano Hospital on the basis of a brief literature review conducted to identify a suitable approach to enable us to compare our results. Various articles describe their organizational model as “team/system care providers” in clinical settings , in specific care programmes , in multidisciplinary team approaches , and in care network organizations . Some articles discuss the concept of a more general and inclusive integrated care system, involving a multitude of strategies as the overall result of interrelationships between individuals, groups, organizations, and systems; in any case, there is a general recognition of the need for harmonization of the multiple perspectives and different strategies in order to improve the technical and qualitative aspects of oncology practice . Predictably, the multidisciplinary approach emerges from all these studies as a key aspect with great importance for cancer. By investigating the evaluation methods chosen by these studies in order to validate our own methods, we found that measurement of the patient's experience is the salient point, and the studies we reviewed vary considerably in how they conceive and measure the patient's experience. The dimensions most frequently evaluated are the patient’s expectations, satisfaction with health care [12,13], mental and social problems, depression and anxiety, and health-related QoL [14,15]. Our approach falls under the aforementioned “team/system care provider” model, as it consists of a team which not only works in collaboration with the oncologist, but also shares and integrates the various complementary medicines (homeopathy and acupuncture) from the first patient’s approach. With regard to the choice of measurement tools, the ESAS  is still one of the most popular scales in use for the evaluation of complex diseases like cancer, and one of the most successful in correlating symptoms with the evolution of the disease and with its treatments. The SF-12 was chosen to investigate the quality of life due to its ease of use by patients. The choice was made to make things easier and clearer for patients that have a lower educational level (12% had low grade school level, 53% had middle school level, 26% had high school level, and 9% had a BA/MA degree). The evaluation of comorbidities revealed the added value of our holistic approach to cancer patients. In their systematic review, Lee et al. reported a wide range of prevalence for comorbidity in cancer patients, ranging from 0.4% to 90%. Moreover, according to the National Cancer Institute (2016) , the top four cancers (lung, colorectal, breast, and prostate) have rates of comorbidity of 52.9%, 40.7%, 32.2%, and 30.5%, respectively. Patients with comorbid conditions alongside cancer often require a heightened level of coordination to manage their diseases effectively . From the perspective of complementary medicine, it is illuminating to see how closely comorbities parallel cancer development. Moreover, literature reports have long affirmed that inflammation and cancer often evolve in parallel [19,20]. The tumour triggers an inflammatory response, while the inflammation feeds the tumour’s aggressiveness and the dissemination of metastases. The map of points where the inflammatory and tumoral processes interconnect and act in concert is under exploration . These pathological conditions are characterized by the local or systemic release of a variety of cytokines, growth factors, and hormones which, by stimulating cell proliferation, can favour the genesis, progression, and aggressiveness of the tumour. TNF-α and interleukin-6, the main cytokines released during chronic inflammation, are known to stimulate the proliferation, survival, and dissemination of cancer cells . Analysis of the comorbidities in our 240 patients revealed that 50% had one or more comorbidities. In most of these, an inflammatory mechanism underlies the comorbidity: arthritic, rheumatic, metabolic, thyroid, and intestinal diseases all have a pattern of inflammation. In an integrated approach, acupuncture is known to have an anti-inflammatory effect , and homeopathy has also proven useful for this purpose . This study is still ongoing and we look forward to evaluating the definitive data on the survival of cancer patients in relation to their diagnosis and course. In any case, the improvement in their quality of life is not in doubt, and this already confirms the added value offered by complementary medicine. The project was funded by the Tuscany regional health authority specifically for the purpose of healthcare and research to verify the efficacy of CAM. The authors would like to thank the administrative department at Grosseto Local Health Authority ASL 9. Thanks are also expressed to Italian Society of Homeopathy and Integrated Medicine (SIOMI) for scientific support. In this paper, Rosaria Ferreri is the main author; she has conceived and designed the experiments, she has acquired and analyzed data and has written the research. Simonetta Bernardini has directed the research, drafted and revised manuscript; Franco Cracolici has realized the acupuncture protocols and analyzed the data with the other authors. Francesca Bechini was working as Medical Trainee in the Centre of Integrated Medicine at the time of this paper and she has collaborated to the data collection. We declare that we have had no funding resources and grant for this research. Baccetti S, Di Stefano M, Rossi E. Le medicine complementari per il paziente oncologico. Sviluppo e opportunità dell’oncologia integrata. Felici Edizioni; 2015. Bourstyn E, Ben Merabet F, Mislawski R, et al. Shared hospital and community follow up of breast cancer survivors (BCS) by a breast cancer network Saint Louis R´eseau Sein improves quality: a patient satisfaction survey. Eur J Cancer. 2010; 8: 225. Becker-Witt C, Lüdtke R, Willich SN. The course of chronic disease under homeopathic treatment – results of a multicenter observational study. Gac Sanit. 2003; 17: 174.